Originating from Bielefeld in Northern Germany, the roots of "Virus" go back to the early-1960's, with Bernd Hohmann in the school band 'The Moonbirds', later joining up with 'Man's World', a rock 'n' soul band, who gradually transmuted into "Virus" circa 1970. Another "Virus" root starts in 1966, with Wolfgang Rieke of the award winning Percy & The Gaolbirds. All the founding members were experienced talents and well-known musicians of the Westphalia region. 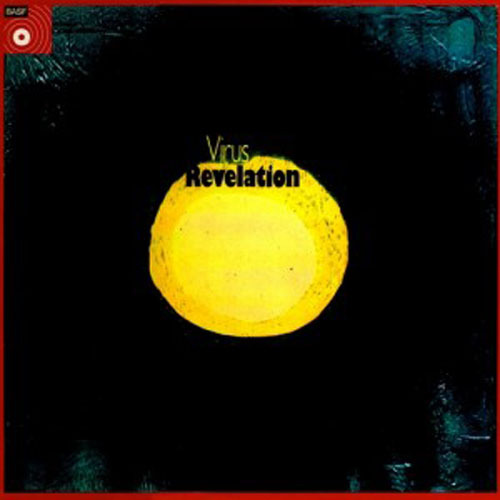 "Virus" were justly one of the most legendary of Krautrock bands, notably in that their debut took the 'Pink Floyd' type of space-rock sound onto new uncharted realms. "Revelation" was aptly titled, being full of invention and surprises within long tracks that sported extensive guitar work-outs, swirling organ, free-riffing and lots of interactive musical interplay, no less so that on the very free adaptation of "Paint it Black" and a most astonishing diversion on a "Saucerful Of Secrets" theme! "Endless Game" is a 12-minute opus that's even more original in its vision of space rock, varying from deep solo bass-throbbing ambience to over-fuzzed guitar spazz-outs. "Burning Candle" is a more conventional rock song, though with impassioned vocals and plenty of energy, "Hungry Loser" is another long piece that begins with a tension-fraught instrumental bit before settling into a cosmic blues piece with dark lyrics and more excellent guitar and keyboard soloing that builds with intensity toward the end. Finally the album concludes with "Nur Noch Zwei Lichtjahre," which comes closer to the deep space moments of 'Ash Ra Tempel' and 'Agitation Free' with some 'Pink Floyd' thrown in. But, like 'Gila' or 'Tangerine Dream', "Virus" were by no means plagiarists, what they did was to venture beyond such influences and come up with a style all of their own, resulting in a powerful cosmic excursion that's largely instrumental and full of surprises. Certainly an album of revelations!